Artefact Description Red / brown wood inlaid with glass. 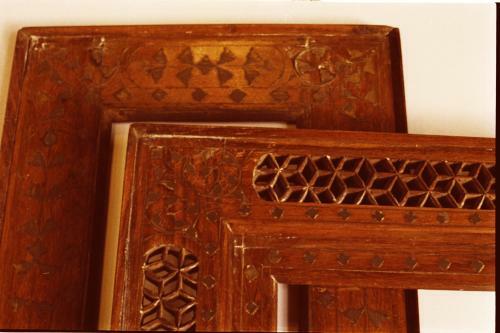 Leaf and diamond patterns carved in each side of frame. History of Artefact Frames belonged to grandparents who lived in India. Special Memories She remembered that they were on display and contained photographs in her grandparent's house. She has recently been intrigued by the detail and craftsmanship of the frames.